Recently I have really been enjoying simple vegetable soups. I am still surprised by how such simple recipes can make such great soups. Many vegetable soups only have a few ingredients and yet they are so tasty. A while ago I came across this recipe for roasted cauliflower and red pepper soup . I really like roasted vegetables as roasting them adds a lot of flavour. Roasted red peppers are among my favorite roasted vegetables and I just had to try a roasted red pepper soup. I had also been wanting to try roasting cauliflower so I roasted the cauliflower as well. This soup was super simple to make though it took a bit of time roasting and simmering. It turned out really tasty! The roasted red pepper was the star flavour and the cauliflower contributed a really nice texture and thickness to the soup. There are a lot of things that you can garnish a vegetable soup with including sour cream, fresh chopped herbs, pestos, etc. I garnished mine with a bit of sour cream the first time and some dukkah the second time. The dukkah was really good as a garnish for the soup. It added a bit of spice and heat and a nice contrasting crunchy texture. Add the cauliflower, roasted red peppers, cayenne and stock. Bring to a boil, reduce the heat, cover and simmer until the cauliflower is tender, about 20 minutes. Serve garnished with heavy cream or dukkah or chopped herbs etc. now THAT is what I call a comforting, enticing bowl of soup – yum! Cauliflower and Dukkah is one of my favorites, so this soup sounds just about perfect. This is a soup! I’ll have to remember this one for later. I’m picturing some crispy homemade herbed croutons on top. Looks good! I wonder if it would work with less liquid as a dip? Kevin, I’ve never had the cauliflower & red pepper combo…sounds great! I gotta get on that dukha. This looks really, really good right about now!!! That soup is lovely! It looks really heary, yet fresh. Oops! I meant hearty, not hairy! Lol! Wow, roasting cauliflower is an awesome way to add great flavor to a soup. Nice! Oh my, roasted cauliflower has to be one of my favorite foods on the planet… and you just elevated it to incredible heights! I am in awe of your gorgeous soup! This is my style, a nice healthy vegan soup! It is amazing how roasting the veggies first dramatically improves the flavor of the completed soup. Looks lovely! This soup looks fabulous and we’re excited that you tried dukkah the second time. Dukkah has been on our minds and just haven’t had the time to try it. We’re soup and dukkah inspired now. Thanks for all you great dishes! i love the simplicity of this nutritious soup…sound delicious! mmm, lovely looking soup! i once made creamy cauliflower soup but never anything like this. must try your recipe! You can never go wrong with a soup like that. 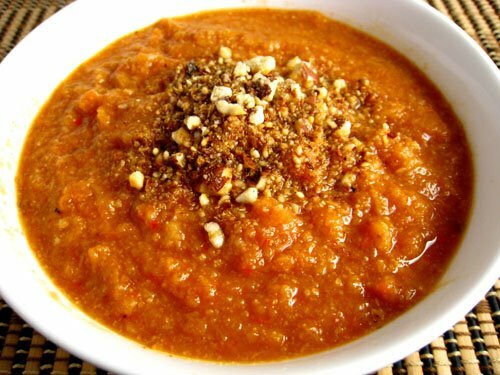 the moment I saw that photo of this soup, I said OMG, roasted hazelnuts or dukkah! Sounds wonderful! Must try it! That is a really nice looking soup, great color and texture. Can you describe the flavor? Kevin, for a guy who suddenly decided to explore the prospects of food, you are doing incredibly well! There’s so much TLC in the food you prepare, maybe you should just join the Industry! This soup is so inviting, Bro! Hand me a bowl and a crusty roll,please!! What a gorgeous soup! Exactly the kind of vegetable soup I enjoy. I’ll have to try this. I have absolutely no idea what dukkah is or where to even get it or how it’s used. I’ve never had a roasted cauliflower soup before. We have some cold weather coming in – this would be perfect to keep warm! I love this combination! Sounds delicious and the color is just gorgeous! Wow, looks amazing. I bet this has a great taste! I’m so glad you tried this and it worked great for you Kevin! this is one of my personal favorites too! thanks so much for trying and testifying my recipe:) that looks beautiful indeed! oooh, what a gorgeous color, and two of my favorite veggies, too! Looks delicious and inviting. I can’t wait for winter to come so that I can make this delicious-looking soup. Wow that looks so yummy. I want that for dinner! I love the vegetable combination – and I love nice, thick chunky soups! This sounds like a delicious soup. I rarely make soup, but am always resurprised at how much I enjoy homemade soup. This soup sounds like a winner! Cauliflower is seeing a lot of action in our kitchen these days, both roasted [and you’re right, it really brings out the flavor!] and puréed to serve in place of mashed potatoes. Cauliflower and red pepper sounds like it would make an amazing soup! The Dukkah sounds really interesting. I learn so much from you..I’ve never heard of Dukkah and it sounds like a great complement to all kinds of dishes! Ditto on the simple vegetable soups! Since I discovered carrot soup, I think I have made three different ones, because it I so fabulous. Roasted Cauliflower sounds really good. Just made this soup and my partner and I LOVED it! I have made another one of your recipes and was not dissapointed! Great job!! Thanks alot. I recently started South Beach and I came across this recipe. YUM! I love it! I made it with frozen cauliflower and it came out delicious. Adding it to my regular recipe rotation. Thanks! I made this soup last night and it was delicious! So easy. I was discussing it this morning during a coffee break and my Egyption coworker loved the use of the dukkha. He said to place some dukkha in a small bowl and pour olive oil over it and use it for dipping bread. Wish I had tried that last night. Love this soup. I make it often. I use veggie broth instead of chicken. I use coconut milk. I leave out the sour creme. I dont mean to be changing your recipe but I want to thank you for showing me how to put cauliflower and roasted red peppers together and allowing me to tweek it for me. I love all your soups (as I have mentioned several times already). Also love croutons on top and maybe some chopped up roasted cauliflower.